"Philip and Mary Ann Cansler were both buried on the Cansler Farm located in Lincolnton, Lincoln County, North Carolina. 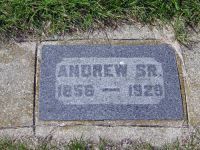 After the farm was sold in 1951, their graves were transferred to the Hollybrook Cemetery along with those of their son and daughter-in-law, Henry and Mary Ann Frances Shuford Cansler. Stones for Philip, Henry and Mary Ann Frances Shuford Cansler were evidently destroyed before being moved to this cemetery." Maplewood Cemetery, Anderson, Madison County, Indiana, U.S.A. Summit Lawn Cemetery, Brazil, Clay County, Indiana, U.S.A.
"In memory of Anthony Deal, born 28 Jan 1807 died 27 Jul 1829, 22 yr 6 mo 7 da"
The coping and headstone of the grave had been in good condition in 1907. At present most of the older grave markers had tumbled over. Some were covered with grass and moss, engravings unreadable. Many of the numbered grave marker stones were lost or unreadable, but we found a few of them and were able to figure out the approximate location. Montrose Cemetery, Montrose, Effingham County, Illinois, U.S.A.